Dietary intake recommendations for the essential micronutrient vitamin E established in many countries vary, and it appears to be still a challenge to define these despite the wealth of data published. 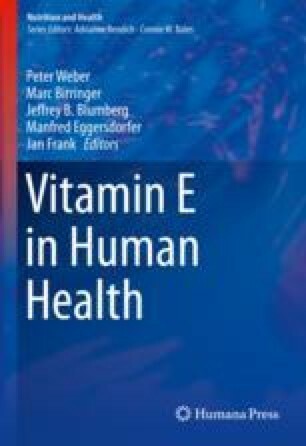 The approaches and markers used to define vitamin E intake in the reports from the European Food Safety Authority (EFSA), the Nordic Nutrition Recommendations (NNR), and the Institute of Medicine (IOM) are being looked at as they are based on very comprehensive reviews and recently published. Though the rationale, concept, and markers used by these agencies to define vitamin E intake are quite different, based on the same scientific evidence, it is of interest that they actually all appreciate the fundamental role of the lipid-soluble essential micronutrient vitamin E in protecting PUFA from oxidation; however they also raise a number of questions how to use these data. The animal and human data indicate that the amount of vitamin E needed to keep PUFAs functional in cell membrane is related to the intake of PUFAs. Thus, in addition to a basal vitamin E requirement, an additional requirement for dietary PUFAs should be considered. Given the proposed health benefits of omega-3 PUFA and the recommendations to increase in particular the long-chain PUFA, we think it is important to revisit the evidence on the interaction of vitamin E and the amount needed to protect PUFA from being oxidized. Codex Alimentarius. 2018. http://www.fao.org/fao-who-codexalimentarius/sh-proxy/zh/?lnk=1&url=https%253A%252F%252Fworkspace.fao.org%252Fsites%252Fcodex%252FMeetings%252FCX-720-38%252Fnf38_01e.pdf. Accessed 22 Jan 2018. Nordic Nutrition Recommendations 2012. Integrating nutrition and physical activity. 5th ed. Arhus: Nordic Council of Ministers; 2014. https://doi.org/10.6027/Nord2014-002.